The gradual change from late summer to early fall in St. Louis has provided a perfect time for our first graders to learn all about seeds and soil and how nature works—through opportunities to put themselves to work in the Lower School garden. With the help of K–12 experiential arts teacher Sheila Alioto, the students are learning about the plant life cycle firsthand—from seeds to blossoms to fruit and to seeds again. On a recent afternoon, they got busy pulling out last season’s tomato vines to prepare a bed for sowing. The plants still had some fruit on them, so the students were thrilled to learn that the tomatoes could continue to ripen, and eagerly hung the vines on the garden fence to receive maximum sunlight. After that, it was time to turn over the soil in the bed and pull out stray weeds. Using a collection of just-right-size rakes, trowels, and shovels, they took turns digging and getting their hands dirty—while closely examining earthworms and bugs and learning what role they play in the garden. Next, they will plant beans and peas and also help care for the chickens that will live in the brand new coop adjoining the garden beds. While digging around in the dirt, students are essentially learning how a mini ecosystem functions and how various aspects of nature relate to each other. Through such intentional place-based learning, the first graders are developing core skills of observation, process, group interaction, and persistence in completing a project. 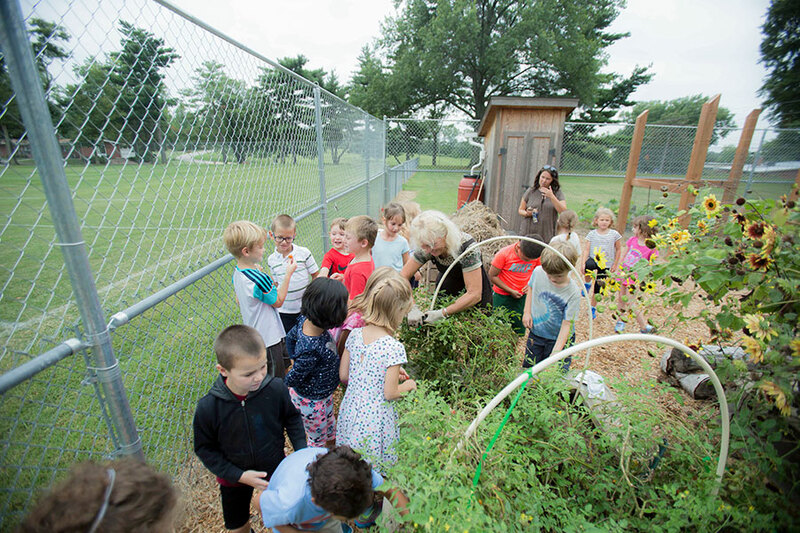 For first-grade teacher Rissa Arens (US’91, C’95), the Lower School garden, and even the larger playground area, are an ideally located “extension of the classroom” providing multiple opportunities for hands-on learning.